Before getting into the details of the Nakshatra Maha yagna let us know the significance of the nakshatras and how does it relate to each of us personally. "Nakshatra" the Sanskrit word simply means "that which doesn?t decay". It is said that there are 27 nakshatras and they are the stars who rule the world and its inmates. Each nakshatra is of a separate significance, quality and content. These nakshatras (27) share equal segments of a circle, each covering 13 degrees 20 minutes. The sequence of the 27 Nakshatras begins with Ashvini Nakshatra in Mesha Rashi and ends with Revathi Nakshatra in Meena Rashi. While witnessed from the earth's surface, it is observed that the Moon passes through this circle of 27 stars in 27 days-which means the Moon resides in a star for a day. Now there is a concept called-Nakshatra Pada. This simply means that each nakshatra in itself is divided into 4 equal parts again. They are termed as 1, 2, 3 and 4 Padas respectively. Each pada in that nakshatra has its own set of traits. When all the 27 nakshatras + Abhijit Nakshatra are appraised together in a homa, it brings its beneficiaries good will all through their lives. Similar to the other royal homas, this Nakshatra Edi Maha Yagya was also performed under the supervision and financing of king men who wished for their people's welfare. What exactly is a Nakshatra Edi Maha Yagna? If a particular person has a Nakshatra yagya done once in his/her lifetime, it will bring in harmony and support for the nakshatra devata for that person. When a whole family of people with different nakshatras and different padas want to be the beneficiaries, they can participate in this all 27-nakshatra homa along with the other fellowmen who also aim for the goodness of their family mates with different nakshatras and variable padas. What is so special about the Nakshatra Edi Maha Yagna? The Nakshatra Maha yagya's role is to invoke the blessings of these nakshatras, one on one for 27 whole days, covering even the 4 padas per nakshatra. This results in timely studies, wedding, birth and an eventful life for people born under the respective nakshatras and their padas. Who does the Nakshatra Edi Maha Yagna? Each nakshtra as discussed above contains a particular set of traits which must be appraised in particular for that particular quality and progress to be endowed over the beneficiary. In this case, the Homa requires 5 pundits and is conducted for 9 days. 9 days especially to symbolize the significance of the navagraha (the 9 planetary rulers of a person?s birth chart) in this aspect. 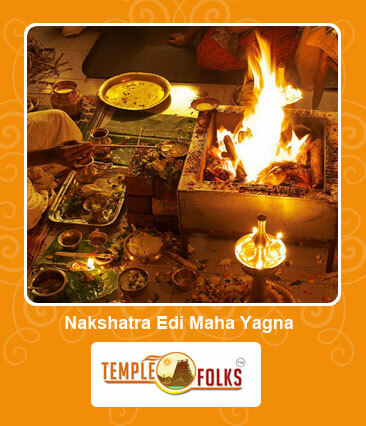 You must know that the yagna requires a very talented set of people who have had a thorough hands-onexperience. Finally, what's in store for you? You must remember that there?s in store abundance not only for you, but for the whole globe that you live, travel and thrive in. The abundance refers to almost everything including peace, serenity, calmness and happiness across the earth. It is just in the good hearts of a very few to participate and donate in such global Homas. We understand that performing such a royal Homa will be impossible by a single individual. Let's join hands to perform this global peace giving Homa. We will accumulate donators for the Homa who can sponsor along with you and you can do your part to make this living space a beautiful and wonderful one to cherish about in the years to come and go!